Cambridge University Press, 9781107039957, 864pp. The conflict that ended in 1945 is often described as a 'total war', unprecedented in both scale and character. 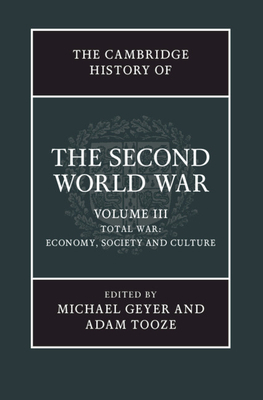 Volume 3 of The Cambridge History of the Second World War adopts a transnational approach to offer a comprehensive and global analysis of the war as an economic, social and cultural event. Across twenty-eight chapters and four key parts, the volume addresses complex themes such as the political economy of industrial war, the social practices of war, the moral economy of war and peace and the repercussions of catastrophic destruction. A team of nearly thirty leading historians together show how entire nations mobilized their economies and populations in the face of unimaginable violence, and how they dealt with the subsequent losses that followed. The volume concludes by considering the lasting impact of the conflict and the memory of war across different cultures of commemoration.